A father-of-four has been left with a criminal record for overfilling his wheelie bin by four inches. Gareth Corkhill, 26, of Whitehaven, Cumbria, received a £110 fixed penalty notice after Copeland Council staff photographed his raised bin lid. When he refused to pay he was taken to court where magistrates added a further £115 to the fixed penalty. 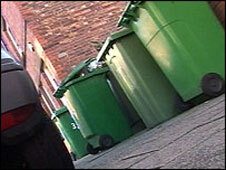 Copeland Council has defended its actions and pledged to continue to take action against overfilled wheelie bins. Mr Corkhill, said: "First I heard of it was from a neighbour who said someone had taken a picture of my wheelie bin, but I thought nothing of it. "Two days later two enforcement officers turn up on my doorstep wearing stab vests, read my rights and then issued me with an on-the-spot fine. "I recycle and all my boxes are always full." Mr Corkhill, who shares a house with his partner and three children and also has a child from a previous relationship, said the authority recently switched from weekly to fortnightly refuse collections, but added that the supplied bins were not big enough to cope. He added: "I could not believe I had been fined for putting rubbish in a bin. "I tell my kids not to throw rubbish away and always use a bin." Whitehaven magistrates convicted Mr Corkhill in his absence of overfilling a receptacle used for waste. In a statement the council said: "Copeland Borough Council will continue to crack down on the problem of overflowing bins, which cause problems for local residents and in the battle to reduce waste. "It is important that we all reduce the amount of waste we send to landfill. "We can do this by recycling more of what is in our bins, and we would advise anyone who has a problem with too much waste to look at what can be recycled."